Seeing a need, and having the passion, a trio of Canby residents want to make Veteran's Day something special in Canby. Organizers Greg Perez, Chuck Fretwell and American Legion Post Commander Steve Renhard, all Canby veterans, are hoping to create something unique and long-lasting to the area. "Veteran's Day is of great significance and importance to me," explained Perez. "It is a day I wanted to share with my brothers in arms. Sadly, there was no observance in our community. "Driving to Albany and all of the crowds was overwhelming to me. When I shared my feelings with other local veterans, I found I was not alone," he added. "We did some brainstorming and decided to make things happen for all of us in our local town." 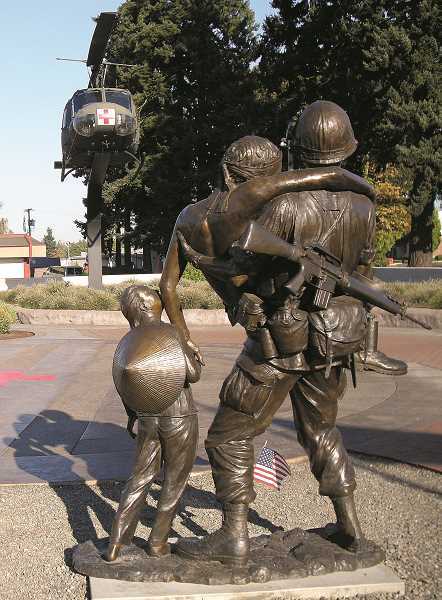 Canby's inaugural Veteran's Day celebration will be held Sunday, Nov. 11, at the Vietnam Veterans Memorial along Highway 99E in Canby. The celebration will also mark the 100th anniversary of Armistice Day. Armistice Day commemorates the end of major hostilities during World War I, which formally ended at the 11th hour of the 11th day of the 11th month in 1918. This year's inaugural event hopes to attract area veterans, families and community members to help celebrate a special day that honors veterans past present and future. "As time goes on, I hope to keep this fellowship with our community and banding together to help one another," said Perez. The program begins at 10:30 a.m. and immediately following the event there will be a free lunch that is open to the public at the American Legion Post 122, 121 First St. in Canby.